Apples of Gold Jewelry offers this charming and sweet etched heart band 6.5mm A rated aquamarine engagement ring for those who are looking for a little something different to offer their significant other. 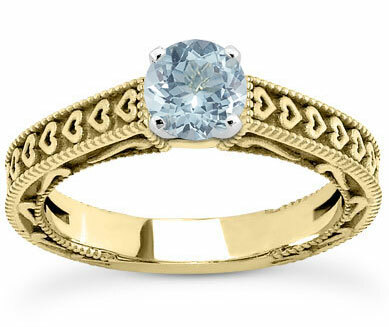 The authentic, frosty aquamarine gemstone is nestled into a 14K yellow gold band, complete with small hearts carved into the band, lending it a sweet and romantic touch that is perfect for expressing your love! The hearts on the band and the special stone are a great design for every day wear! We guarantee our Etched Heart Band Aquamarine Engagement Ring, 14K Yellow Gold to be high quality, authentic jewelry, as described above.